A passionate and informative local can make all the difference in your understanding of the sights of Italy. We tell you what makes a great guide, how they are licensed in Italy and how to hire the right guide for you. So how do you curate the best guides in one area of Italy? We personally toured with many of these guides, asked trusted contacts for recommendations and took nominations online from readers and subscribers. Profiles of more than 30 local tour guides and touring companies– expert in art, history, wine, gastronomy, adventure and more — from Cinque Terre to Venice and spots in between. 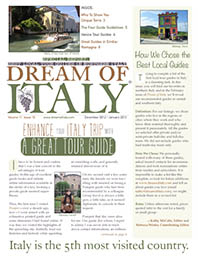 Special Report: Italy’s Best Tour Guides in Central and Southern Italy covers tour guides in the rest of Italy.